Today was my first day eating cooked food since December 31, 2007. While not technically part of the raw food diet trial, many people expressed interest in knowing what it was like to return to cooked food, so I’m happy to share those thoughts. Well, to be honest I can’t say I’m happy, since I’m really not feeling very good, and I’m somewhat inclined to return to eating mostly (if not completely) raw tomorrow. By the way this isn’t the official postmortem of the trial — I’ll post that monster later. I’ll include a couple photos of what I ate today, but I’m not going to look up all the nutritional info — I really need a break from that. I was incredibly itchy at the gym this morning; I hope that problem goes away soon. That’s been one of my strongest motivators not to continue eating the low-fat raw diet. My skin just doesn’t seem to like it. But as it turns out, going off this diet today made me feel much worse… more so than any individual day of the 30-day trial itself. My weight stayed the same at 178.0. Net weight loss is 8.0 pounds in 30 days. So that’s the official net weight loss for the entire 30-day trial. My body fat also dropped 1.8 percentage points during this time. 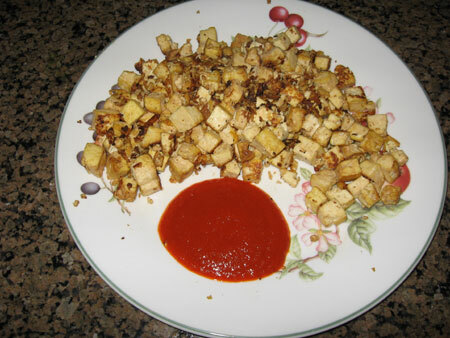 I decided to dive right in with a cooked meal of sautéed tofu. It’s a 14oz block of organic firm tofu with some tamari. I didn’t use oil. The tofu has about 16g of fat. I ate it with some hot sauce (pictured) and a little vegan sour cream (not pictured). The sour cream probably added about 7-8g of fat. The whole meal is about 400 calories, about half of which are from fat. The last time I ate cooked food after going raw for a while, it tasted totally dead to me. This time that wasn’t the case at all. In fact, this food tasted better than ever. It was different than I remembered though. The tofu was so incredibly rich and creamy, and there were subtleties in the flavors I never noticed before. On the downside the hot sauce was overwhelming. Before the raw trial, I’d normally eat this with several tablespoons of hot sauce, about double the amount shown in the photo. But this time I could only finish about 80% of the hot sauce on the plate. It was so spicy, and I was sweating after just a few bites. I’d usually have this meal with about 12oz water, but this time I needed double that to stop my mouth from burning. Apparently I’ve lost most of my spice tolerance. I used the same amount of tamari I used to (about 2 teaspoons). I wondered if the food would taste too salty since I haven’t had any salt for 30 days. It didn’t. It actually tasted less salty than I remembered, perhaps because I was focused on the creaminess and spiciness instead. The tofu tasted so rich that it was almost like eating cheesecake. In retrospect I would have preferred half as much tofu with a large side of steamed broccoli. Even though my stomach felt full afterwards, I had the urge to scarf down at least another pound of food or a green smoothie. It felt odd to stop eating so soon. Shortly after breakfast I felt a little loopy, almost like I’d had a couple glasses of wine. I swear my vision got a little blurry too. Those feelings passed after about 10 minutes, and then I felt very energetic and happy, almost euphoric. But I noticed my mind seemed cloudier than usual, as if a fog had just come down. After breakfast I made a cup of vanilla nut Teeccino to sip in my office. Teeccino is a caffeine-free coffee substitute made from roasted chicory, dried fruits, and a few other items. You can make it with a regular drip coffee maker. I used to drink it occasionally before this experiment. Today it tasted bitterer than I remembered. Yes, bitterer is a word. I guess my taste buds have shifted since I really didn’t care for it. I initially made two cups of it but ended up dumping the second one. Later this morning I had a couple slices of sprouted whole grain toast (Ezekiel 4:9 bread) with a little soy margarine. Again, it tasted better than I remembered. The flavors were so rich that it was like eating fresh baked bread right from the oven. The earthy flavors and textures seemed just perfect. It tasted so good that I ate two more slices right afterwards. About an hour after eating the toast, I started feeling poorly. The first thing I noticed was that I was becoming very drowsy. I started sneezing a lot, and my nose was filling up. I didn’t have any stomach problems, but I felt like I was having some kind of allergic reaction. I didn’t want a complicated lunch, so I just ate 5 clementines (raw) and some pistachios (not raw). A couple hours after lunch, I felt even worse, like I was coming down with a cold. I tried to nap for 90 minutes, although I probably only slept for 20. When I got up I had a mild sore throat, which I still have now. Everyone else is my family has been sick lately, so I thought to myself, Crap… this is no good. For the rest of the afternoon, I ate two green smoothies (one liter each, same kind I’ve been making for a while) and a Fuji apple. I started feeling a little better around 5pm but still under the weather. For dinner I decided to brave some cooked food again, but I opted to steer clear of bread and tofu. 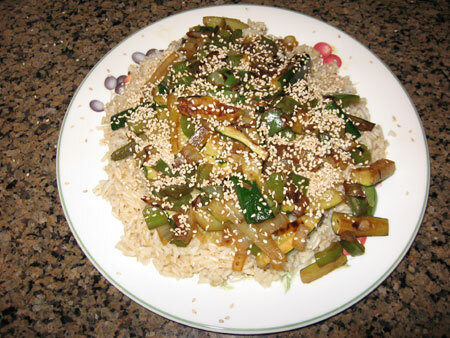 I stir-fried some veggies (green pepper, zucchini, garlic, onion in 2 tsp olive oil), put them on a bed of steamed brown rice, and sprinkled some raw sesame seeds on top. It tasted good but no better than I expected. I ate all the veggies but didn’t finish all the rice. Later in the evening, I started feeling worse again, which is where I am now as I type this. I keep having to blow my nose, I feel a lot of tension in my neck and shoulders, I have a mild headache, and my eyes are burning a little. I took my temperature at 8:15pm, and it was 99.5. Yesterday it was 98.2. The cooked food I ate today tasted good, on average better than I remember. But it seems to have been accompanied by a high price tag. I feel pretty lousy right now, about a 3 on a scale of 1 to 10. This is much worse than dealing with some itchiness and dry skin. I drank a lot more water today, but I still felt thirsty throughout the day. Less than a minute after gulping some water, I feel like I’m dying of thirst again. I didn’t seem to get thirsty much at all during the trial. Aside from the water I added to smoothies, I was only drinking one or two glasses of water each day in the final week, sometimes as little as 12 oz. I’ll go to bed early tonight and try to get some extra rest. I’m not sure how I’ll eat tomorrow — I’ll see how I feel in the morning. At present the thought of eating only fresh fruit for a while seems rather appealing, especially if it helps me feel better. Even though I ate a good bit of fruit today (several bananas, 5 clementines, an apple), I feel like my body is craving even more of it. I could really go for a watermelon right now, but I’m all out. Unfortunately my kitchen is very low on fruit, at least based on the standards of the past 30 days, so I’ll have to go shopping soon to get more if I want to keep eating a lot of it. I think I’ll eat some more clementines or maybe an Asian pear before bed though. I’m not really hungry, but my thirst just isn’t quenched by water. I actually feel thirsty for some juicy fruit. Even the thought of eating fruit makes me feel a little better… so sweet and juicy. I wish I could say what I’ll do for February, but I really don’t know. I feel like I’m in limbo right now, not quite sure which way to go. It seems my body underwent some changes during this trial that simply weren’t apparent until now. I never had such adverse effects like this when coming off my other raw trials, so this is new territory for me.